LG Top Load Washer Error Code E6 – How To Fix? My LG top loading washing machine shows E6 error code. The washing machine will not run or wash on any cycle. Washer will not spin or work at all. Does the error code or fault code identify which part is bad? We need the correct procedure to clear the error code E6. If this is a DIY job, can you list the parts needed or a quick fix for the top loading LG washer. I would prefer to fix it myself as right now I am unable to afford a new one. 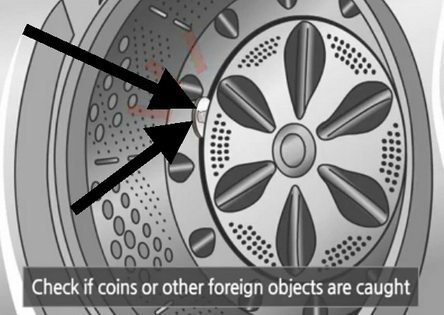 An item such as a coin or paperclip has jammed in the washer between the drum and the pulsator, remove the item. The motor has overheated and you simply need to wait until it cools down. Check with flashlight to see if there is anything jammed in the drum and preventing it from spinning freely. If you find a coin or other object that is jamming the drum, remove it with a pair of pliers and test the washer. 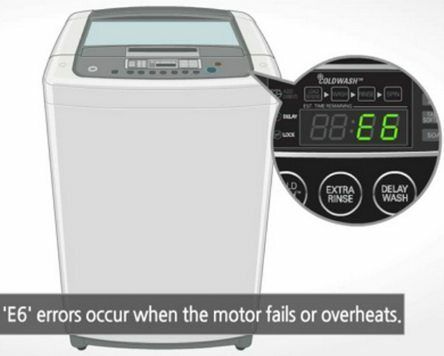 If the LG washer error code E6 means the motor has overheated, simply wait an hour or so for it to cool down and try doing a test wash cycle to see if the problem was only an overheated motor. 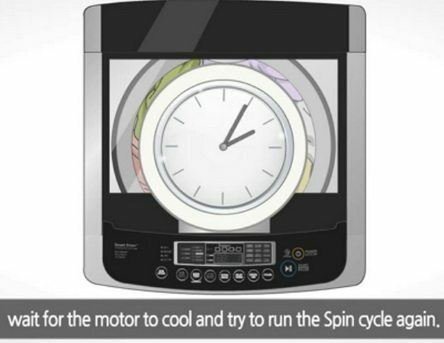 If the washer has no objects jamming it or the motor has not overheated, you will need to troubleshoot if either the clutch or motor has a fault. Depending on your LG model number, this may be one part or two = Clutch Motor Assembly or Motor and Clutch. The E6 error is telling you that the clutch is causing the error or fault. This fault can happen if a paperclip, nail, coin, or a different object is jammed in between the tub and pulsator. Take out all clothing or towels from the washer. Use a flashlight or torch and visually check the bottom of the washer drum. Look for the seam that is between the pulsator and the drum. Check to see if objects are jammed in the seam and causing the washer to not spin. Many times there will be a nail, a coin, or paperclip jammed in between them. If you see an object jammed between the drum and pulsator, remove it with a tool such as a pair of pliers or needle nose. Once the object is removed, do a test wash to see if the washer is now working and the error code is cleared. 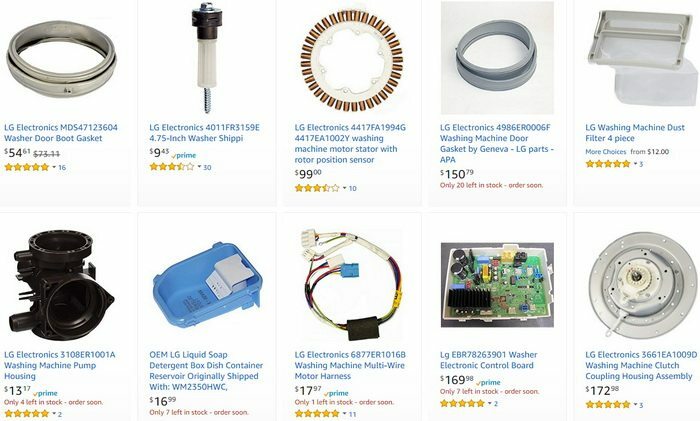 If you troubleshoot your LG top load washer and find that you need parts such as a motor, clutch, or other part to fix the washer, see below for all LG top load washer parts that you may need to fix your broken washer. PLEASE NOTE: There are 2 different type models of LG top load washers. See the 2 videos below for “How to dissasemble and repair” the 2 different types and to see the difference. 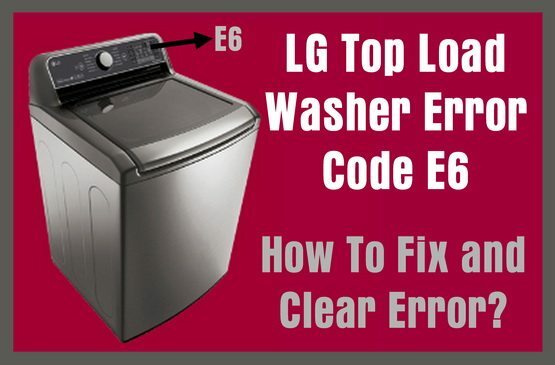 If you need some help fixing or troubleshooting your LG top loader washer with the E6 error code, please leave a comment or question below and we will write back with an answer to help you to fix your washer yourself. Getting the E6 Error code. There is nothing jammed in the drum. What do I test next? I believe I read it could be a bad motor. Repairman told us the E-6 Error code ended up being a broken transmission. Repair would be close to the cost of a new unit and the machine is only 1 year old. We are currently getting a E6 error code. There is nothing jammed in the drum. And we tried resetting it. We also waited to see if it was overheating. The code is still popping up. Previous post: What Are The Best Methods To Block Out Light In A Bedroom Window To Sleep Better?